Last December Italian daily La Stampa reported that Iran is using Venezuela do duck UN sanctions by using aircraft from Venezuelan airline Conviasa to transport computers and engine components to Syria for use in missiles. Today an official report from the Israeli Foreign Ministry further details Venezuela's extensive ties with Iran, including providing Iran with uranium for its nuclear program. YNet has a copy of the report, which was prepared in advance of Israel's Deputy Foreign Minister Danny Ayalon visit to South America this week. The information is based on intelligence gathered by Israeli and international agencies. Bolivia has uranium deposits. Venezuela is not currently mining its own estimated 50,000 tons of untapped uranium reserves, according to an analysis published in December by the Carnegie Endowment for International Peace. 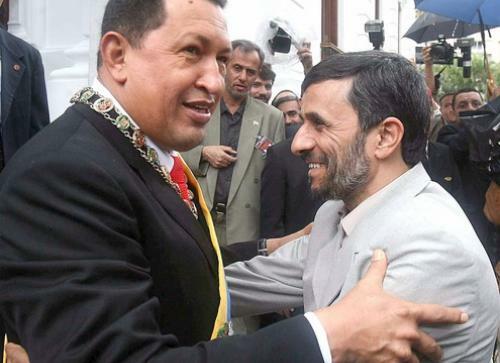 The Carnegie report said, however, that recent collaboration with Iran in strategic minerals has generated speculation that Venezuela could mine uranium for Iran. Iran's largest embassy in our hemisphere is located in La Paz. Iran is increasing its presence in Latin America. The report also describes the presence of Hezbollah cells in Latin America. Just last month a raid by Dutch authorities rounded up a cocaine gang with Hezbollah ties engaged in the drug and weapons trade and money laundering. For background reading on Hezbollah's presence in Latin America, please read this 2004 report on Terrorist and Organized Crime Groups in the Tri-Border Area (TBA) of South America.